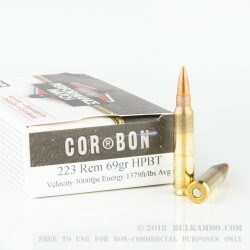 Designed to deliver maximum precision to satisfy the needs of competitive shooters, these .223 Remington cartridges from Corbon come in boxes of 20 and fire a heavy 69 grain match bullet at 3,000 feet per second (tested with a 20 inch barrel). The bullet is boat-tailed for superior wind resistance and delivers match-winning accuracy in the hands of a skilled user. 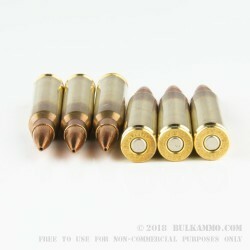 This ammo is a little bit different from Corbon's typically hot defense loads. 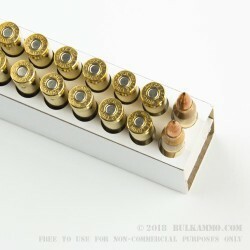 With the needs of competitive shooters in mind, these cartridges use a low-recoil, low-smoke, low-flash formulation designed to improve the user's accuracy. 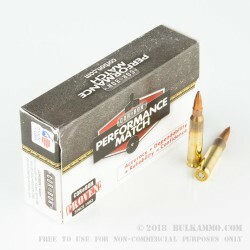 This ammunition is made in Sturgis, South Dakota using non-corrosive Boxer primers and brass cases.